Social scientist Kimberly Scott has been doing this since 2007, when she launched a National Science Foundation (NSF)-funded project called CompuGirls. Based at Arizona State University (ASU), the project reaches girls aged 8-12 from under-resourced schools in the Greater Phoenix area and Colorado, with activities to develop technical skills and encourage computational thinking in a way that’s culturally relevant. CompuGirls is designed to reach girls outside of their normal school day. Opportunities include a one-week program during Fall or Spring Break, an 8th-period class over a couple of semesters, and a three-week summer class. In Phoenix, Scott is able to combine all three courses over five weeks. The activities include digital storytelling; working with Scratch software to build a game or simulation related to a social or community issue the girls have identified; and exposure to coding through researching a topic and putting it together in a virtual world. Some of the girls’ work is accessible at the CompuGirls website. In engaging the girls in computer science, Scott and her team have to challenge assumptions that the field is boring and doesn’t relate to their interests. The program offers opportunities to interact with guest speakers from various scientific fields and to go on field trips to companies such as Intel. In addition, taking on technical challenges such as performing debugging – which students may complain about at the time – gives them a sense of accomplishment; and Scott’s research shows that it makes them more interested in ideas related to computational thinking. Where Scott has analyzed the students’ outcomes across comparison groups, the CompuGirls participants have shown a greater ability to project themselves into the future, and are more able to articulate how what they do in the present can help them meet their future goals. Being able to imagine a future identity as a technologist is key. CompuGirls participants learn how to program the robots as well as study social aspects of human to robot interactions. They also look at questions such as how robots should interact with different kinds of people, and whether there’s a way for them to express emotions. There is evidence that the CompuGirls experience has a positive impact on the educational experience of its graduates. A couple of girls from the original class of 60 CompuGirls became first-generation college students at ASU, and worked with Scott in a Research Experiences for Undergraduates project over the summer. One of them contacted their CompuGirls classmates and found that among 10 who were at ASU as first-generation college students, three had declared a STEM-related major. All attributed their success in part to CompuGirls. Giving young women that sense of belonging is also an emphasis of Andrew Williams, who heads the Humanoid Engineering & Intelligent Robotics (HEIR) Lab at Marquette University. Indeed, this is a theme of Williams’ recent TEDx talk, Belonging in Technology: What I learned from Steve Jobs. Prior to his appointment at Marquette, among his accomplishments was leading Spelman College’s SpelBots robotic soccer team to competing successfully at several international competitions. A recent NSF-funded STEM for All meeting co-led by Scott was a chance to talk about the National Robotics Initiative (NRI), which he saw as a great opportunity for an intersection between Scott’s work and robotics for young African-American, Hispanic, and Native American students in grades K-12. NSF funded the project. 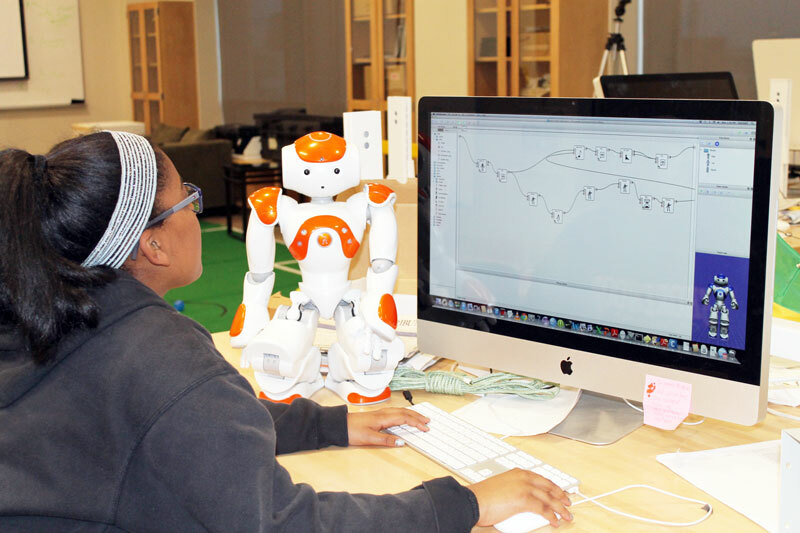 With NRI’s focus on developing robots that can closely interact with people, Williams and Scott saw the opportunity to have young women study robotics in conjunction with the social sciences, computer science and engineering in a culturally sensitive way. Humanoid robots have the ability to interact with people–to see them, talk to them and respond to them. Among their anticipated uses is helping the elderly and people with disabilities safely interact with their environment. The robotics project has built on Scott’s work in teaching digital literacy in the context of social justice, identity and gender issues. CompuGirls participants will learn how to program the robots as well as study social aspects of human-to-robot interactions. They’ll look at questions such as how robots should interact with different kinds of people, and whether there’s a way for the robots to express emotions. “In this project we’re communicating to the girls that we’re going to teach you how to use these technology tools with robotics to advance your community, better understand yourself and show that you do belong in technology and you have some valuable contributions you can make,” said Williams. In a world where humanoid robots will be part of our future, engaging these young women now gives them a role in shaping that future. In Williams’ research lab at Marquette, students are already using a 3-D printer to produce parts of humanoid robots, and the robots have played robo-soccer in Brazil. They are also developing a smartphone-type interface with the robots. Williams has also recently been awarded an NSF I-Corps for Learning grant investigating the scalable sustainability of creating humanoid robot kits–using the 3-D printed robots–to teach STEM. Williams has a message for young women on the occasion of Computer Science Education Week.